The family of National Reserve Corporation owner Alexander Lebedev, which already owns two English newspapers, will launch the London Live TV channel in the British capital. ESTV, which is owned by the entrepreneur’s son, Evgeny Lebedev, won the license for the TV station, which is expected to reach around 4 million homes in London. ESTV’s local TV license for the London Live channel will run up to 12 years, Britain’s media regulator, Ofcom, said yesterday. ESTV is owned by the son of Russian entrepreneur Alexander Lebedev, Evgeny, who also manages his father’s other media assets in the UK — the Evening Standard and The Independent newspapers. Their editorial experience will be used to produce content for London Live, which could be launched as soon as September 2013. “I’m confident that this will change London for the better,” Evgeny Lebedev tweeted in early February. According to British media, the license is potentially the most lucrative since 1997, when Britain’s last national TV station (Channel 5) was launched. As the winner of the auction, ESTV’s channel will reach around 4 million homes in London. Ofcom also noted that ESTV’s proposal covered a significant range of subjects. London Live plans to broadcast, initially, for 18 hours a day, covering news, entertainment, weather and sports. Its plan for the first five years includes an annual marketing budget of £5 million ($7.8 million). London Live is also planning to join private satellite and cable networks, such as Sky and Virgin Media. Presence in those two platforms alone could cost Lebedev’s entities another £1 million ($1.5 million) a year. The bid put content-related expenditures at £15 million ($23.4 million). According to The Guardian, the launch of London Live could also have a positive effect on the profitability of The Independent and Evening Standard. Alexander Lebedev bought a 75.1-percent stake in Evening Standard in January 2009; in March 2010 he purchased The Independent and its supplement, The Independent on Sunday. The Russian paid £8.3 million ($13 million) for control of Evening Standard, while The Independentchanged hands for a symbolic £1 million. He has since turned Evening Standard into a free newspaper, and, in October 2010, he launched a new British newspaper called i, co-published with The Independent. Alexander Lebedev stated in November 2012 that his British media business would continue losing money in a controlled manner over the next two years. 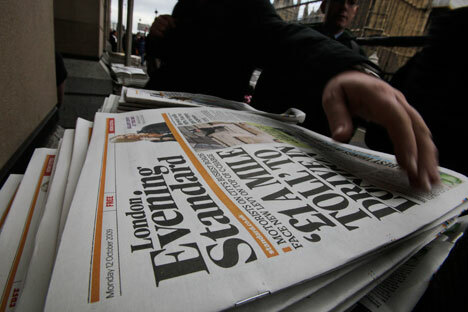 At the same time, Evening Standard turned a profit of slightly more than £1 million for the year ending on September 30, 2012, the paper’s representatives stated earlier. Meanwhile, The Independent’s annual losses far exceed £10 million ($15.6 million). Lebedev has invested a total of £80 million ($125 million) in the British newspapers since 2009.